and then she falls asleep. After two weeks of strategizing with painstaking detail about how I could give Ava a rest time, have her hair done, her wedding clothes on, and be at the church for pictures at 1:45 pm (the time she is normally sleeping), Ava’s internal sleep clock took over all and she fell asleep on the five minute drive from the church to the park. She was completely comatose for the next two hours while she was transferred from lap to lap under the blazing, August sun. She woke up just in time to add her sweetness to the chapel pictures and line up for the wedding march. As the well practiced flower girl, Ava was able to deplete her basket of petals in a mere three handfuls. And after having a two hour power nap neither the pew nor Grandma Penny could contain the wedding excitement of this three-year-old. I heard “Mama!” right before I saw a red lollipop waving flower girl fly across the front of the church and up the stairs to take her place next to her “mama.” I felt my face turn the shade the Charm Blow Pop that Ava continued to wave at the congregation attempting to listen to the pastor’s address to the couple. He was exhorting Chad and Emily to speak in song, hymns and spiritual songs to each other, and I was quite certain that at any moment Ava might take up this encouragement and begin to awe the guests with her musical talents in addition to her baton twirling skills. You can view more of her amazing wedding photography at www.jennifermckinneyphotography.blogspot.com! 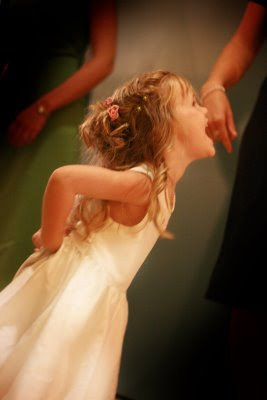 Ava twirled and danced, twirled and danced, and twirled her away around the reception. She was certain that as the very special flower girl she must have a place at the head table, even if that place was Mama’s lap in front of Mama’s food and most importantly Mama’s cake. She had climbed her way up there during the oh so critical best man’s speech. The only way the bridesmaids and I could keep her from upstaging her uncle was to stick more pieces of cake in front of her. After three pieces of wedding cake and half a piece of chocolate torte she pushed away the remainder and declared something that I never thought I would hear her say: “here you go Mama, I’ve had enough cake!” She flew out of my lap to join the gift bearers and resume her role as wedding twirler. As our Saab light blinked midnight, Ava’s glitter slippers hit the car floor and her curls pillowed the little head dreaming of petals, dancers, music, kissing and most importantly, cake! Such a beautiful flower girl she makes!